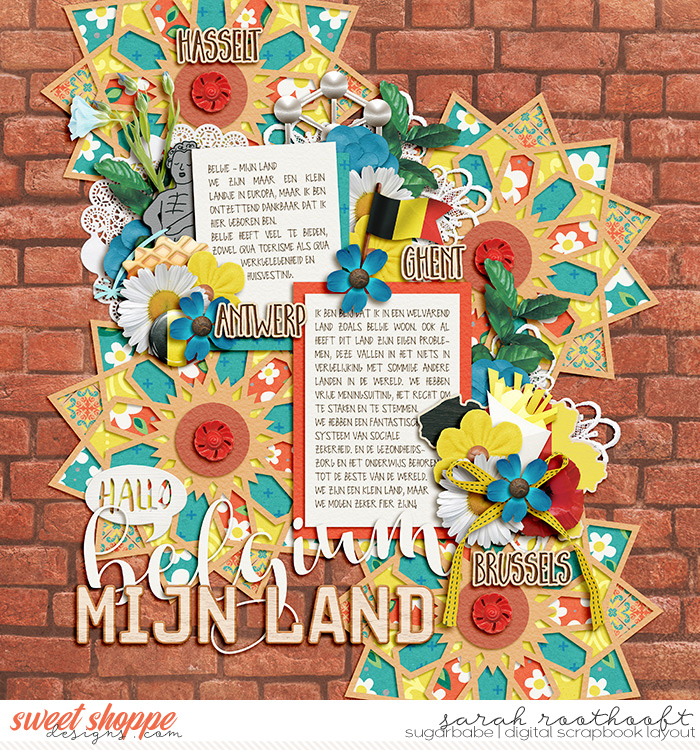 Photoless layout about my country and why I love my country so much. I love this photoless layout, Sarah, especially the use of that brick background! Gorgeous patriotic page! Love all those fun shapes and colors against the brick background. Terrific work! Beautiful! I love the brick background, too! I wish we had google translate on gallery pages, lol! I adore these country kits - you rocked the non photo page here. So wish I could read what you love about Belguim. So beautiful! Great photo-less page! All the color and patterns look fantastic! This looks fabulous with all the patterns and geometric elements. Great job as always, Sarah. You rock! Oh wow! I love those shapes and patterns on the brick wall!! Ha, perfect kit for you! I have no idea what it says but it looks great. Love the brick background paper. Sarah, your background is amazing! The bright colors really pop against the brick! I love how you wove the themed elements (even the peeing statue ) into your clusters! !